Nathaniel Zetter is a PhD candidate in English Literature at the University of Cambridge, where he is researching the conceptual exchanges between war and sport in twentieth century cultural discourse. Beyond this current project, he is interested in the cultural history of cybernetics, the aesthetics of the graphic narrative, and the politics of digital media. Fallout 3 begins as the player’s avatar is born. The infant’s father asks the baby/avatar/player whether they are “a boy or a girl”, and a text overlay presents the player with the options “Boy” and “Girl”. The unintentional distancing effect of this moment is caused by a clumsy blurring of the game’s diegetic and non-diegetic elements. The attempt to force all game elements—including the player’s extra-narrative decisions—into the diegetic space result in the foregrounding of the video game’s mechanics, rather than their inclusion into an immersive and continuous first-person perspective. The moment only serves to remind the player of their perceptual distance from the avatar over which they have control. As if in parody of the Lacanian mirror stage, first-person video games allow players to view themselves only in mirrors, or other reflective objects. The hands, which grip the gun that is typically rooted to the avatar’s sight, remain severed from the avatar body until the player encounters their reflection. Outside of these moments of self-perception, in-game avatars in first-person games exemplify the “fragmented body” (Lacan 2002, 78) of Lacanian psychoanalysis almost too perfectly; thus signaling the central importance of the activity of gazing to the video game form. In his Four Fundamental Concepts of Psychoanalysis, Lacan provides us with a tripartite periodization of the structure of the gaze in Western painting. His account begins with the iconic stage, in which paintings “have the effect of holding us under their gaze”, at the same time as they are intended to appeal to the gaze of God (Lacan 1979, 113). The second stage he elaborates is the “communal”, in which paintings attain the social function of appealing to the gaze of “audiences”, whilst holding “[b]ehind the picture” the power of the gazes of those who have commissioned them and displayed them in their palaces and mansions (113). Finally, the “modern” “epoch”, although retaining the features of the communal stage, involves “the gaze of the painter… claim[ing] to impose itself as being the only gaze” (113). There is a certain attractiveness to lining up this periodization with the well-known periodization framework of Michel Foucault and Gilles Deleuze—not least because it underpins so much work in cultural and media theory today. Their understanding maps three phases—sovereign societies that employ a power which is centralized, directly violent, and managed by a strict hierarchy; disciplinary societies that employ a power which is decentralized, operating violence through confinement, and managed through bureaucratic organization; and, as outlined in Deleuze’s late writing, the control societies that employ a power which is distributed so as to involve the “break down” of sites of confinement, the use of “digital” language, the replacement of “molds” by “modulations”, of the individual by the “dividual”, and of production by “metaproduction” (1995, 178-181). Accordingly, the iconic epoch would correspond to sovereign societies, as the gaze is that which holds authority over subjects from one central power; the communal to disciplinary societies, as the gaze is that which creates a mass of individuals based upon commodity fetishism; and the modern to those of control, as the gaze, claiming to draw its power from the artist alone, becomes a form of biopolitical management. Whilst Lacan is analyzing the structure of the act of viewing a painting, rather than the illusion of seeing “into the painting” through perspective, his periodization provides a theoretical catalyst for my discussion of the structure of perspective in video games, and for the possibility of periodizing such a structure. However, my delineation of perspective in video games will attempt to draw out a periodization based not upon the origin of each type in specific historical epochs, but instead based upon their conceptual structure within the present epoch. This theoretical project facilitates not only the periodization of the objects in question, but also the analysis of a periodization structure at work in the objects themselves. As such, the way in which artistic perspective comes to be an apparatus through which social forms and notions of “historical progression” interact will be of central concern here. Since the turn to three-dimensional graphics in the early 1990s, video game designers have employed perspective as a major tool in the development of the medium. Three principal perspectival modes have emerged which, although being to some extent anticipated by marginal modes in older visual media, have become particular to and ubiquitous in the formal apparatus of the video game. The first is the perspective from behind the character’s retina, or “first-person mode”; the second, the perspective floating above over the character’s shoulder, or “third-person mode”; and the third, the free-floating aerial perspective, or “strategy mode”. The aim of this essay will be to delineate these three perspectival modes, to examine how each perspective structures the ways in which the player interfaces with the video game, and lastly to place this understanding of perspective in relation to the periodization framework outlined above. My methodology for the analysis of video games follows the media-theoretical work of Alexander R. Galloway, McKenzie Wark, and others. Galloway in particular has made the important claim that video games are a social form which represent the workings of control societies as such, since they “flaunt” “informatic control” (2006, 90), and are, “at their structural core, in direct synchronization with the political realities of the informatic age” (91). As such, the ways in which their design structures the interfacing between player and game offers a significant insight into the understanding of perceptual experience under this form of society. Indeed, I argue that the interaction between such differing modes of perceptual experience in video game production offers an insight into the understanding of such interaction between differing modes of perceptual experience under the control episteme. Before beginning, a brief note on the usage of the terms “perspective”, “interfacing”, and “interaction” will be necessary. A typical definition of perspective in painting is offered by Erwin Panofsky, who writes that perspective denotes a form of “seeing through”, in which “the entire picture has been transformed… into a ‘window,’ and… we are meant to believe we are looking through this window into a space” (2012, 27). The operation of perspective is “an ordering of the visual phenomenon” (71)—it is the logic which structures the visual material of the painting. This definition of perspective is my starting point—perspective in video games transforms the flat surface of the screen into the deep world of the game. As such, it is the representational foundation for the interface which mediates between the player and the game. However, as Galloway has convincingly argued, such an interface is not a static object; he writes that “an interface is not a thing, an interface is always an effect. It is always a process or a translation” (Galloway 2008, 939). To expand upon Galloway’s notion, I use “interface” as a verb to signify the active quality of this process. In my usage, the avatar or the cursor interacts with the game world, whilst the player interfaces with the game. It is through perspective that the player’s interfacing is structured. The interrelationship between perspective, interfacing, and interaction is crucial, since it is that which determines the agency of the player—it allows the running of software to become the playing of a game. An examination of this interrelation will enable the imbrication between video game perspective and the socio-political perspectives of the control episteme to become clear. Figure 1: Call of Duty: Black Ops II. Treyarch, 2012. Game still. At the most basic level, “first-person” designates games in which the player is positioned so as to appear to see out of the eyes of the avatar. In his discussion of the first-person shooter (FPS), Galloway develops a cinematic model for the first-person perspective from “the first-person subjective camera angle” (2006, 40). In this “perspective shot”, “the camera lens and the eyes of a character become one”, resulting in the “viewer see[ing] exactly what the character sees” so that the “camera merges with the character both visually and subjectively” (40). For Galloway, the shot distances the viewer since it ruptures the illusion of the film, and, therefore, “is marginalized and used primarily to effect a sense of alienation, detachment, fear, or violence” (40). By contrast, in video games, it “is quite common and used to achieve an intuitive sense of motion and action in gameplay” (40). This is because the player appears to hold agency in the game world—they are not just seeing through the avatar’s eyes, but also seeming to act through their body. The avatar and the player are ostensibly converged, so that the player perceives their interfacing with the game to be equivalent with the avatar’s interaction with the game world. Moments in which the limits of the player’s agency are revealed, such as cut scenes, therefore serve to distance the player, breaking their immersion in the game. As McKenzie Wark puts it, “the gamer oscillates between connection and break with the character” (2007, paragraph numbered 150). This oscillation, between what I term convergence and divergence, is based upon how securely the game design is able to hide the limits of the player’s agency. In order to emphasis convergence between the player and the avatar, that avatar’s physical perception is most commonly used as the logic for what is included in the first-person perspective. The “heads-up-display” (HUD)—a screen overlay which provides the player with information not available from the diegetic visuals—serves to highlight this point. 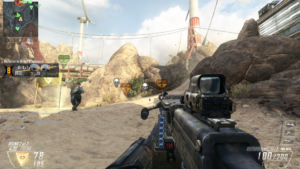 In the Call of Duty series, the HUD provides the player with information such as the number of bullets remaining in their gun’s magazine, and their position on a map of the immediate environment (fig. 1). This information represents knowledge held by the avatar/character, but which is not immediately knowable from their visual perspective. The game designer assumes that a soldier will be aware of how many bullets are left in their gun, and the HUD is perceived to be the most efficient way of presenting this information—in the form of pure data. The character’s perception of the world is simulated by the use of a non-diegetic overlay upon the diegesis of the character’s sight. The HUD is not a part of the perspective of the first-person game, but a necessary “supplement” to perspective which allows that perspective to function (Galloway 2006, 35). However, the necessity of the supplement is not simply the narrative—the HUD is simultaneously a supplement to the perspective of the game, and to its playability. It reveals information from the character’s knowledge to the player, but only information which is required for the player’s interfacing with the game. This is why ammunition is given as pure data, but many other elements are excluded, as well as being why elements such as the map of the immediate environment often drift into the presentation of information which even a soldier highly skilled in geographic orientation would not know. Nevertheless, the supplement of the HUD does reveal a crucial element to games of this kind—the player’s interfacing is structured around the optical nature of the first-person perspective. For Wark, in the FPS, the primary logic of the player’s interfacing with the game world is the “act of targeting” (2007, paragraph numbered 127). The orientation of seeing through the avatar’s eyes necessitates what Galloway has classified as an “essentially optical” form of targeting (2007, 88). For Galloway, this means that, in his example of Counter-Strike, “the methods by which objects are selected and relationships are established between subjects… flows from the simulation of linear ‘rays’ that are extended through mathematical matrices” (88). In Counter-Strike, “ballistics and optics merge”—it “is a line-of-sight environment, and nothing more”, so that “encounters are strictly symmetrical: one target, one bullet” (89). This observation allows Galloway to perform a reading of the politics of the FPS based on its “optical modality of thinking and identifying the objects of thought” (90). He concludes that “Counter-Strike is fascism”, since it “pegs everything on force as an uncontaminated aesthetic act, optical or otherwise”; here working from Walter Benjamin’s famous notion that “fascism is an aestheticization of politics” and “not… a politicization of the aesthetic” (91). However, Galloway’s reading of optics may lead us to conclude that interfacing in the first-person perspective is, rather than fascist, apolitical, in the sense that its system operates in exclusion from a political system. Wark argues that both the “gamer” and the object come “into existence through the act of targeting” (2007, paragraph numbered 149). Whilst he also reads the FPS as a political form, we may take Wark’s observation about targeting as a key reason to view interfacing in the first-person perspective as apolitical. The entities of the player and the objects the player targets both come into being not through the structure of politics, but through the binary logic of a linear directed action. There are no citizens in the game, only the targeters and the targeted. In fact, the first-person subject sounds much like Aristotle’s definition of the apolia, the man excluded from the state, who “by nature is mad on war: he is a non-cooperator like an isolated piece in a game of petteia” (1987, 509). The state of being apolitical is like the azux, a piece on the game board that is separated from its allies, isolated and defenseless, and therefore defined by its lone position facing its enemies, rather than its relation to the fellow citizens of the polis. What I refer to as apolitical is therefore a state of exclusion from political life, rather than a lack of political interest. In its status as that which is outside of politics, the Aristotelian apolia can be associated with those terms which refer to the situation which pre-exists the politically organized state—such as Deleuze and Guattari’s “war machine”,  or the Hobbesian “war of all against all”, which, quite suggestively for the present analysis, is called “noise” or “fury” (often also “furor”, as in the Latin) by Michel Serres (1995, 83). Figure 2: Friedrich, Caspar David, “Wanderer Above the Sea of Fog,” 1818. Kunsthalle Hamburg. 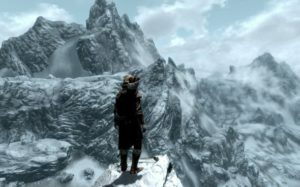 Figure 3: The Elder Scrolls V: Skyrim. Bethesda Game Studios, 2011. Game still reproduced from “http://www.altergamer.com/sandbox-vs-linear-story-telling/”. are given a political meaning. The fact that the Middle-Eastern dictatorship, waged war on by the player of Call of Duty 4: Modern Warfare, is shown to possess nuclear weapons is highly significant in the same way it would be in any other narrative media. As is the fact that one plays as an American or British soldier targeting ubiquitously rendered “enemies”. To call the dynamics of gameplay apolitical in this moment of symbolically significant targeting is therefore not to deny the politics of signifying in video games, but to observe the positioning of the player as a lone entity whose only possibility for action is determined by a binary of target/non-target, shoot/don’t shoot, kill/be killed. Indeed, to position the soldier as an apolia is, as I will return to later on, to position them in a highly significant relation to the kinds of political management present in the control episteme. At its most basic, “third-person” designates games in which the avatar is visible from the player’s perspectival position. The “camera” hovers somewhere behind and above the avatar, and can generally be moved by the player to offer different lines of sight on the game world. Whilst this degree of movement is allowed, the camera is always attached to the avatar. There is no existing model in the cinema for this perspective because, in filmmaking, the subject of a shot is always identified by its relation to objects within the frame. Techniques such as lighting and lens focus are used to identify one subject from the field of vision. By contrast, in the third-person game, the subject—which is the avatar—is a constant. The objects beyond the avatar are then defined by their relationship to it. In this way, whilst the avatar is a part of the game world, it is situated on a different perspectival plane than objects of the game simultaneously as it is incorporated among them. This is a different perspectival relationship between viewer and frame than exists in the cinema, and therefore, a different perspectival model is required. In painting, the relationship between the subject and the objects within the frame can be structured in multiple ways. Caspar David Friedrich’s painting, Wanderer Above the Sea of Fog (fig. 2), creates a form of perspective which I find analogous to that of the third-person game. 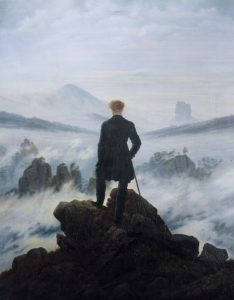 One of the most famous works of the German Romantic movement, Friedrich’s painting depicts a lone wanderer standing on the edge of a rock cliff face, looking out over the expanse of mountains and mist before him. The focus of the painting is dual: it is both the wanderer depicted in the foreground, and the landscape depicted in the background. The wanderer himself is an indeterminate figure, as he is seen only from behind and only as a viewer of the landscape. However, his body is clearly foregrounded by the strong outline it cuts against the background. It is this duality in the painting’s focus which I find analogous to the third-person perspective in video games (fig. 3). The viewer of Friedrich’s painting is in the position of simultaneously viewing the landscape and the viewer of that landscape, so that they retain their own perception, whilst also experiencing that of the wanderer. They are associated with the wanderer through incorporating his perception, whilst not being converged with it. In the third-person video game, the same association applies. The player views the game world and the avatar simultaneously within the same frame. Hence, the player is associated with the avatar without being converged with them. We may call this a perspective of dual perception. Third-person game design continually attempts to associate the player with the avatar, at the same time as this dual perception retains a distance between the two. Therefore, if the contention in the first-person game was between convergence and divergence, we may say that in the third-person game it is between association and alienation. Whilst the game design is premised on the maintenance of immersion for the player, the success or failure of this immersion is always causing, respectively, either the association with, or alienation from, the avatar. Due to the separation between the player and the avatar in the third-person perspective, there is no one form of interfacing which has become the norm in these games. In third-person shooters and action games, a system of optical targeting akin to that of the first-person game is employed. However, it operates at one stage removed from that in the FPS, so that the player targets an object using the avatar, rather than through them. In the third-person role-playing game (RPG), a cursor is often used as a supplement to the avatar, in what Galloway calls a “spatial” form of targeting, wherein “relationships are established via the simulation of aggregate ecosystems of agents arranged in spatial models” to create “lists of eligible targets and ineligible targets” (2007, 89). Yet, even these two dominant forms are not the exclusive forms of interfacing by which the player controls the interactions of the avatar with the game world. The most precise observation to make may be simply that the third-person perspective enables a multiplicity of types of interfacing. Some are specifically oriented towards immersion, such as in the Uncharted series; others, as exemplified by Galloway’s analysis of World of Warcraft, sacrifice immersion in order to allow the player a greater depth of control through the complex data displays which take the appearance of “informatic systems” (89). In this way, by contrast to the linear logic of optics in the first-person game, the third-person game perspective is defined by its malleability towards whichever type of interfacing is perceived to suit the narrative and algorithm of the game. This is, I contend, why the third-person game crosses so many generic boundaries, while the first-person game has been wedded, in the majority, to the shooter genre. Figure 4: The “map-view” in Total War: Attila. The Creative Assembly, 2015. Game still. “she” (Galloway 2007, 106). However, this definition misses the fact that, in the strategy game, the player is not given an avatar. Instead, the cursor is used to select objects over which the player has control, operating through what Lev Manovich, in his foundational work on new media, called a “logic of selection” (2001, 123). This term describes the way a “user… navigates through a branching structure consisting of predefined objects” (128). The purpose of such a structure is to disengage the player from the control of one character, so that they can take on an abstracted position of command. The game is oriented, as purely as it can be, towards the ability to order and control the objects within the game. There are identifiable antecedents of the strategy video game going back to strategy board games such as Chess or Go. However, more recent precursors are certainly the “tabletop” strategy games invented in the 1800s for training strategic thinking in young military officers, such as the German Kriegspiel. Since the 1970s, the structure of these games has been adapted into numerous commercial tabletop miniatures games. Out of these, the “wargames”, such as fantasy games—like Warhammer Fantasy Battle—and the numerous historical simulation games, resemble strategy video games quite closely. The limitation with any of these tabletop games is, however, that the size and complexity of any game is capped by the physical restrictions of the space for the board, the number of miniatures, and, mathematically speaking, the increasingly complex dice rolls which determine the outcome of actions within the game. The video game immediately resolves these issues by consigning the limitation of these elements to the processing power of the computer on which the game is played. 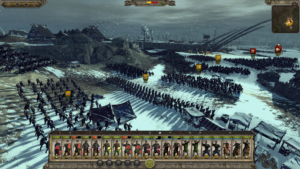 Figure 5: The “battle-view” in Total War: Attila. The Creative Assembly, 2015. Game still. representation of a photographic landscape. It would be imprecise, therefore, to say that the strategy game perspective is that of a camera; instead, we can note that within its perspective it uses the optics of the camera rather than the optics of sight. Representational, it is closer again to its antecedent, the tabletop strategy game, wherein a group of three miniature trees will stand in for an entire forest. As Deleuze and Guattari remark about Chess, these games are a “semiology”—the pieces of the game are “coded” with meaning (2003, 353). In the tabletop strategy game, this semiology employs synecdoche so that the elements are coded in such a way that the part stands in for the whole. The same is true of the strategy video game, but the move onto the computer enables the game to go beyond the means of physical synecdoche. In games from the Age of Empires series, the player has “villagers” chop down trees in order to gain the “wood” necessary to build a “barracks”. This “barracks” will produce “soldiers” in exchange for the “gold” other “villagers” collect. The synecdoche is expanded to code not only scale, but also systemic functioning, enabling the creation of economic and military structures. This is a semiology used to create a State. Synecdoche is not the only form of representation in these games. In expanding the limits of the single tabletop to an entire game world, a map is often used as the basis for organizing internal geography. 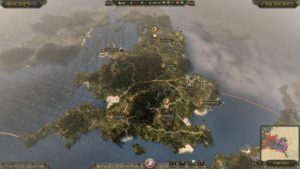 In some games, this has taken the form of two separate perspectival modes—such as in the Total War series, which employs a “map-view” for the geopolitical, global workings of the game (fig. 4), and a “battle-view”, which uses the synecdoche described above, for the local battles (fig. 5). The majority of strategy games do not make such a clear distinction between the map and the territory. 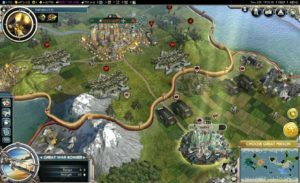 The Age of Empires and Civilization series are typical of the majority form, in which the map-based and synecdoche-based representational modes are synthesized into one game world. The player’s perspective, therefore, rather than shifting from one mode into another, must incorporate the cartographic global and the panoramic local into one frame. Figure 6: Sid Meier’s Civilisation V. Fireaxis Games, 2010. Game still. appropriate model for the perspective of the strategy game. Art history, Siegert explains, has traditionally viewed the Dutch seascape painting as the result of the continued development of geometric perspective in the early seventeenth century (6). However, he proposes that it should be viewed instead as the development of a “dual perspective” which combines the perspective of navigation and the perspective of mapping (9). This does not embody “coming to terms with the problems of representing the immense spatial depth of the sea”, but rather “a ‘spatial revolution’” which is defined by the way the cultural techniques of navigation and mapping operate as “space control” (7). Similarly, we can see the strategy game perspective as combining a local understanding of space, based on military command, with the global understanding of space, based on mapping and geopolitical systems (fig. 6). Siegert’s crucial insight is that this perspective is formed out of “space control”, which he describes by using the Greek word, “chorein”—“an act of setting up space” and “which introduces a spatiality and a being of things outside the polis” (8). This chorein, in the case of the ship, “constitutes the possibility to rule the placeless as maritime space, to found colonies, to visit foreign coasts, to degustate and trade this year’s wine, or to subdue other peoples” (8). Such a perspective is therefore representative of a schema of networked power relations. The perspectival delineation of space allows the State to define boundaries of non-spatial entities so as to make them definable by the terms of their rule. The dual perspective of the strategy game enables the player to enact this chorein—creating a State, and that which is outside of the State, through the perspectival definition of space. Galloway has argued that strategy games “are essentially simulations of markets”, because “the algorithms of game play are structured around an economy of resources and productive capabilities” (2007, 95). The combination of a market structure with dual perspective causes the player’s interfacing to be defined neither precisely by the role of the archon, the magistrate, nor by the role of the strategos, the general. Instead, their interfacing is operative of pure strategia, pure command here rendered as a system of control-based management. In this way, the State created by the player functions through a synthesis of market and military logic into a free-floating governance which finds equivalent all forms of control when directing its subjects towards productive activity—the “villagers” are ordered to “chop wood” in just the same way as the “soldiers” are ordered to “attack” enemy troops. Franklin (2015, 57) has established that this correspondence between kinds of machines and kinds of society derives from Norbert Wiener’s cybernetic theory, and, therefore, we may suggest that it involves a certain kind of playful appropriation on the part of Deleuze. As such, it is worth keeping in mind the contingency this implies between the cybernetic heritage of this framework and that of video games themselves—along with Deleuze’s own playfulness in offering the formulation—as I draw a correspondence between each form of society and perspectival modes in video games. The apolia of the FPS may be corresponded with sovereign societies, as its model of the application of power—the centralized binary of target/targeted, shoot/don’t shoot, kill/be killed—resembles the mode of power which Foucault defined as “the right to take life or let live” (1979, 136). To call this mode apolitical is therefore to associate it with a form of power which the episteme supposes itself no longer to employ. It is apolitical from the point-of-view of the informatic control-based social form of the video game, because of its association with modes of power from the supposedly distant past. The dual perception of third-person perspective involves the identification of an individual through dissociating them from their environment—as in the form of identification native to “discipline [which] ‘makes’ individuals” (Foucault 1995, 170). Furthermore, that individual is put to work by a power which sees from one fixed position—a panoptical mode of observation (see Foucault 1995, 200-209). Finally, the free-floating dual perspective of the strategy game allows a distribution of observation—characterized by surveillance from all places at once—and the operation of sampling, selection and balance-based management characteristic of control. In this way, the correspondence between video game perspective and the forms of society described by Foucault and Deleuze foregrounds the allegorical existence of all three power structures within video games. This is not simply to say that, in Deleuze’s characterization, we continue to make use of “simple mechanical machines”, such as clocks, alongside thermodynamic and cybernetic machines today, but that new forms which correspond to the power structures of the past continue to be invented and made use of today. This would suggest a cunning of history which not only makes use of the old or new forms, but remakes the old ones to have a place within new social forms. Such a means of inventing and drawing upon forms which are perceived as belonging to the past can be exemplified with a brief examination of a particular moment in video game production. In Eve Online, the operation of direct violence through the mode of the first-person perspective highlights that which is rendered invisible from the control perspective of the strategy game. The strategy game was always based on the simulated working of such elements, but this example foregrounds the process by having players perform the function, in essence, of a “soldier” in Ages of Empires. In using the first-person perspective for this operation, it makes visible the hidden use of direct, violent applications of force under the free-floating apparatus of control. If the third-person perspective had been used, the question would always be open of why the player of Dust 514 could not also be inducted into the informatic system. The insight given by the periodization framework is that the use of those excluded from the political to service its function, under control, is tied to the consignment of such apolitical entities to the conceptual space of the past. In this way, direct applications of force are rendered invisible under the perception of immateriality, ephemerality, and diffusion. A particularly evocative example in the case of the military-industrial themes of Eve Online and Dust 514 would be the way in which, within the borderless, distributed “War on Terror”, various roles in the application of force are taken away from traditional militaries and given instead to private military companies, special forces “operators”, and drones which exist in spaces of legal exception or lack of legal definition. Here, the local and direct force serves to enable the global and indirect control by simultaneously being appropriated into its system and excluded from its politics—the apolia is used as a method of the polis. The player in Dust 514 can only ever use the money of the Eve Online player to increase their usefulness for the latter—buying better guns, or armor, or so on. They cannot induct themselves into the political space so as to become an agent in the market as such. Their economics is a submarket which is employed by, predicated upon, and simultaneously excluded from that of the global system. Meanwhile, the player of Eve Online is able to employ the workings of the local without ever becoming local, to employ directness without ever becoming direct, and to employ linear optics without ever losing their ability to move “among a continuous range of different orbits” (Deleuze 1995, 180). The complex imbrication of social forms with a self-reflexive periodization, which is able to exclude certain subjectivities from the system by imagining them as entities of the past, raises many further issues. A certain self-reflexivity in one’s analytical optic is required—as in the seeming, and seemingly all-too-neat, parody of Lacan in the FPS. It is not enough, therefore, to employ periodizing concepts in order to fix objects within analytical categories. Indeed, to do so risks rendering invisible the very contingencies which one seeks to draw out between cultural objects and the systems of knowledge which are capable of forming them and making use of them. It seems to me that there is a self-periodization at work in the social forms of control; it employs a distinction from the past in order to rationalize specific forms of experience, management, or governance as natural to the present episteme. However, this does not make periodization less useful for analysis and critique today, but all the more useful if the cultural logic at work in the objects to be periodized is carefully deconstructed and subsequently reapplied to our understanding of those objects themselves. Nevertheless, it is important to note that, while the notions of fuzzy sets or overlapping forms is methodologically necessary for the critic or theorist, from the point of view of the social forms which characterize control, such permeable boundaries do not exist. The drawing of lines on the map or of borders to the frame of periodization are means by which the digital logic of control operates the binary of switching “on” or “off”. Indeed, it is the concreteness of this classification, categorization, and boundary-making, which marks out the subjects and the non-subjects of the society of control. I am grateful to Abby Schulman and Josh Weeks for their insightful comments on drafts of this essay, and to Seb Franklin for both his comments on the essay itself and his indispensable guidance during the research that formed it. All quotations from video games are my own transcriptions; for full citations, see the references below. Early on in video game analysis, a tradition developed which employed psychoanalysis to interpret the gendered gaze in the form—most prominently, Anne-Marie Schleiner’s essay, “Does Lara Croft Wear Fake Polygons?” My references to Lacan are not intended to propose a resurrection of psychoanalytic concepts for the analysis of video games. Indeed, I am wary of the all too neat correlations which can be drawn between psychoanalytic theory and elements of digital media. Lydia H. Liu’s recent work on the relationship between cybernetics and psychoanalysis provides a possible genealogical explanation for these contingencies between video games and psychoanalytic theory, as well as an example of the historically grounded analytical work required to unpick them (see Liu 2010). An extended definition of sovereign societies can be found in Foucault’s History of Sexuality, Volume 1: An Introduction; of disciplinary societies in Discipline and Punish: The Birth of the Prison System; and of control societies in Deleuze’s essay, cited here, ‘Postscript on Control Societies’, as well as the interview with Antonio Negri titled ‘Control and Becoming’—both of which are collected in Negotiations—and ‘Having an Idea in Cinema: (On the Cinema of Straub-Huillet’. References to the “war machine” and its correlative opposite, the “State”, are scattered throughout A Thousand Plateaus—see especially the chapter, “1227: Treatise on Nomadology:—The War Machine”. The major exception to this “generally” would be “fixed-camera” horror games, such as the early iterations of the Resident Evil or Silent Hill. For histories of the development of such war games, see Philipp von Hilgers’s War Games: A History of War on Paper and Ed Halter’s From Sun Tzu to Xbox: War and Videogames. It is worth noting that I choose the example of Eve Online and Dust 514 for its specificity, rather than its ubiquity. An alternate example which is supportively suggestive here would be the “grand strategy” games made by developer Paradox Interactive. By enabling the player to carry over their saved games from each historically bounded title to the next, they render invisible the very elements which the interaction between Eve Online and Dust 514 makes visible. For example, the form of the geopolitical map at the end of the medieval-set game, Crusader Kings II, can be advanced to the early modern-set Europa Universalis IV, setting up a linear, progression-based model of history in which one quite literally divests oneself of the perspective of a feudal sovereign in order to make room for that of a disciplinary nation-state. This is because so many third-person games make central the data-processing of information work—see Galloway’s discussion of World of Warcraft (2008, 945-947). Neferti X. M. Tadiar’s work provides a crucial touchstone for understanding the means by which late capitalism makes use of populations whilst simultaneously excluding them from its political and economic order (see Tadiar 2013). Age of Empires. Ensemble Studios, 1997. Aristotle. 1987. A New Aristotle Reader. Edited by J. L. Ackrill. Princeton: Princeton University Press. Boltanski, Luc, and Ève Chiapello. 2007. The New Spirit of Capitalism. Translated by Gregory Elliott. London: Verso. Call of Duty 4: Modern Warfare. Infinity Ward, 2007. Call of Duty: Black Ops II. Treyarch, 2012. Crusader Kings II. Paradox Development Studio, 2012. Deleuze, Gilles, and Felix Guattari. 2003. A Thousand Plateaus. Translated by Brian Massumi. London: Continuum. Deleuze, Gilles. 1998. “Having an Idea in Cinema: (On the Cinema of Straub-Huillet)”. Trans. by Eleanor Kaufman. In Deleuze and Guattari: New Mappings in Philosophy, Politics and Culture, edited by Eleanor Kaufman and Kevin Jon Heller, 14-19. London: University of Minnesota Press. Dust 514. CCP Games, 2013. The Elder Scrolls V: Skyrim. Bethesda Game Studios, 2011. Eve Online. CCP Games, 2003. Europa Universalis IV. Paradox Development Studio, 2013. Fallout 3. Bethesda Game Studios, 2008. Foucault, Michel. 1979. The History of Sexuality, Volume 1: An Introduction. Translated by Robert Hurley. London: Allen Lane. Foucault, Michel. 1995. Discipline and Punish: The Birth of the Prison System. Translated by Alan Sheridan. New York: Vintage. Franklin, Seb. 2015. Control: Digitality as Cultural Logic. London: The MIT Press. Friedrich, Caspar David, Wanderer Above the Sea of Fog, 1818. Oil-on-canvas, 98.4 cm × 74.8 cm. Kunsthalle Hamburg. Galloway, Alexander R. 2004. Protocol: How Control Exists After Decentralization London: The MIT Press. Galloway, Alexander R. 2006. Gaming: Essays on Algorithmic Culture. London: University of Minnesota Press. Galloway, Alexander R. 2007. “‘Starcraft,’ or, Balance”. Grey Room 28: 86-107. Galloway, Alexander R. 2008. “The Unworkable Interface”. New Literary History 39 (4): 931-955. Halter, Ed. 2006. From Sun Tzu to Xbox: War and Videogames. New York: Thunder’s Mountain Press. Lacan, Jacques. 2002. Écrits: The First Complete Edition in English. Trans. by Bruce Fink. London: W.W. Norton & Company. Liu, Lydia H. 2010. “The Cybernetic Unconscious: Rethinking Lacan, Poe, and French Theory”. Critical Inquiry 36 (2): 288-320. Manovich, Lev. 2001. The Language of New Media. London: The MIT Press. Panofsky, Erwin. 2012. Perspective as Symbolic Form. Translated by Christopher S. Wood. New York: Zone Books. Serres, Michel. 1995. Genesis. Translated by Geneviève James and James Nelson. Ann Arbor: The University of Michigan Press. Schleiner, Anne-Marie. 2001. “Does Lara Croft Wear Fake Polygons? Gender and Gender-Role Subversion in Computer Adventure Games”. Leonardo 34 (3): 221-226. Sid Meier’s Civilisation V. Fireaxis Games, 2010. Siegert, Bernhard. 2014. “The Chorein of the Pirate: On the Origin of the Dutch Seascape”. Grey Room 57: 6–23. Tadiar, Neferti X. M. 2013. “Life-Times of Disposability within Global Neoliberalism”. Social Text 31 (2): 19-48. Total War: Attila. The Creative Assembly, 2015. Uncharted 3: Drake’s Deception. Naughty Dog, 2011.
von Hilgers, Philipp. 2012. War Games: A History of War on Paper. Translated by Ross Benjamin. London: The MIT Press. Wark, McKenzie. 2007. Gamer Theory. London: Harvard University Press. World of Warcraft. Blizzard Entertainment, 2004.